The October commemoration of the ‘Holy Translators’ focuses on the creation of the Armenian alphabet and on the accomplishments of the Holy Translators. In modern times the entire month of October has been designated as a “Month of Culture.” Armenians throughout the Diaspora and Armenia mark this with events not only in remembrance of the past, but in celebration of modern-day scholars, theologians, writers, translators and in our parish, teachers of Armenian schools. 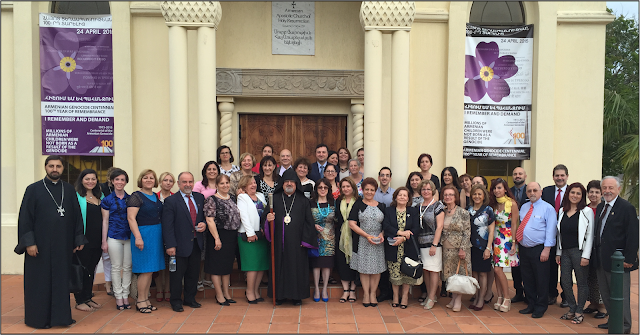 On Sunday, 11 October 2015 a special service and blessing took place at the Armenian Apostolic Church of Holy Resurrection on the ‘Feast of the Holy Translators’. With the invitation of His Grace Bishop Haigazoun Najarian, all teachers of our Armenian Schools were recognised for their valuable contribution toward instilling our cultural heritage and national identity through education in our future generations. During the service, teachers received Holy Communion and were also witness to the Blessing of the Water with the ‘Muron of Victory’. The Primate had recently arrived from the Mother See of Holy Etchmiadzin bringing the blessed Holy Muron to our Diocese. Following the Divine Liturgy a reception was held in the Edgarian hall in honour of our teachers.